Many of my adult ESL students have a problem being understood when they say the word "water." They have found it frustrating when they try to order a glass of water at a restaurant. And "water" is just one of those words that is very hard to avoid using! "Water" is such a simple and common word for most native English speakers, but it really has a lot of complex sounds for English language learners. The "t" is the universally difficult sound to pronounce in this word as it is pronounced as a quick "d" by native speakers (I'm talking about American English, here). The "w" is also difficult, as is the "er" sound. I had a recent experience with this word that I found more interesting than usual due to my experiences with my ESL students. I spent a few days with a native English-speaking two-year-old child who supposedly has a speech development delay. He's seeing a speech therapist. The adults around the child were trying to help him out by breaking up certain words into syllables and encouraging him to repeat the words. One of the words was "water." The interesting thing to me was that when the adults broke up the word into two syllables, they said "wa-ter." The "t" was stressed as a very strong "t" sound. I'm sure the child will eventually pick up the common way to say this important word the American English way, but I'm not sure if the strong emphasis on the "t" sound is helping him at this time. Because of my experience with adult English language learners, I would have said "wa-der," with a "d" sound. I just find language acquisition at any age and level to be fascinating. In my next life, I'll spend more time studying this subject (as well as becoming a forest ranger). It's easier to decide how much to charge ESL students in small groups after you've determined your hourly rate for ESL lessons. Students usually want to work in a group to get a reduced rate (otherwise, most English Language Learners seem to prefer working one-on-one with a private ESL tutor). You are not likely to get students in a small group to each pay the same amount as the individual rate. However, you should definitely charge more for the group ESL lesson than you would normally charge for an individual student. It does, or at least it can, take more preparation time for a group of ESL students than an individual student, and you are offering your services to more people. You should be compensated for your work. There is no hard and fast rule about how much to charge, but a good general rule is to charge individual students in a group two-thirds of your hourly rate for individual ESL lessons. So if you normally charge $30 per hour and you have two or more students, you would charge them each $20 for the hour lesson. 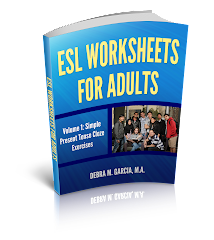 Almost on a daily basis, I receive emails from folks asking questions about teaching ESL to adults. Some of the questions are about teaching methods or grammar--most of those questions I answer with links to certain pages on my ESL website. 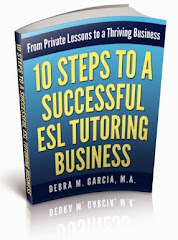 I also receive many questions about the business part of running an ESL tutoring business. And lots of questions about how to get started. I usually write back to the questioner and sometimes write the answer here in my blog if I have the permission of the asker to publish his or her question. I've decided to try to put all these questions and answers (and a lot more) in an e-book about how to start an ESL tutoring business. I'll be referring to all the prior questions I've received, but I'd like this book to be very thorough. Please contact me with any questions you might have about starting and running an ESL tutoring business.